The need to find a mouth guard for grinding teeth is usually the result of teeth grinding and jaw clenching, also known as Bruxism. 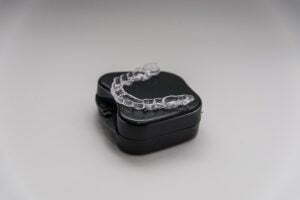 Why is a professionally custom made mouth guard for teeth grinding (based on a dental impression of your teeth) the preferred choice to help relieve Bruxism? Bruxism is excessive grinding of the teeth and/or excessive clenching of the jaw. Note* Sleep bruxism can be definitively diagnosed in a sleep laboratory by means of a costly test called polysomnographic recordings. They are called many names. The occlusal guard, night guard, nocturnal bite plate, dental guard, night/mouth guard for teeth grinding, and bite splint are the most common terms used. A true custom fit mouth guard for teeth grinding is made by taking a dental impression of your teeth. A stone replica of your exact dental anatomy is then made from your impression. The difference between a custom made dental guard and a stock type that you would by in the store is quite significant. The main problem with the “one size fits all” type is that mouths (in general) are not one size. Men typically have bigger mouths than women. A teenager vs an adult is going to be a completely different size. The arch of teeth can vary greatly from person to person. So when you buy an over the counter type (even the boil & bite guards), disappointment usually follows. Most common complaints include being “too bulky”, “uncomfortable to sleep in”, “falls out during the night” etc. If you must wear a mouth guard for teeth grinding (and let us warn you, if you are grinding/clenching your teeth night after night, you really do need to be wearing a night guard) your best bet is to get professionally fitted and have a custom night guard made from either a dental lab online or your local dental office. If cost is an issue, you can go through a night guard lab like ours online. By going this route, you can order directly through the night guard company. Your online night guard lab will ship out a do it yourself impression kit (consists of mixing putty and a plastic tray). You take your own dental impression and mail it back to the company. Your true custom night guard will be processed and shipped to you. Cost varies from company to company but you can expect to pay somewhere between $100-$200 for a custom mouth guard for grinding teeth. Be sure to choose an online lab that will work with you to make sure that you end up with the right guard for you. 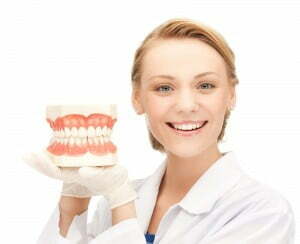 Here at Sentinel Mouthguard Co. we make sure that you are completely satisfied with your purchase or your MONEY BACK. Keep in mind that the Sentinel warranty and return policy is unlike any other. We stand by our products and will always work with you to your absolute satisfaction. This means that if you are dissatisfied with your product for any reason, you can either contact Sentinel within 90 days for a full refund or opt to continue working with us until you get a great fitting guard. Our commitment to you is 100% satisfaction. When you start to shop for a custom night guard, you may become confused about which one to choose. How do you know if you need a hard type or a soft type? What exactly is a dual laminated night guard? What if you grind your teeth during the day? Do you need to be wearing a day time guard as well? Most of all, will any of these guards be comfortable enough during sleep? These are all important questions and we’ve noticed that people are searching the web for answers quite frequently but the information that is being put out there on the web is often times conflicting and vague. Here we will attempt to answer these questions in more detail. So how do you know if you need a hard night guard, a soft one or the dual laminate type? Here’s the not so great news. Even dentists can’t all agree on which mouth guard for grinding teeth is better. You should seek to evaluate your own teeth grinding habits and make a guided choice based on what you know about your own particular situation. Establish what type of teeth grinder/jaw clencher you are. A dentist can look at your teeth and tell you if you’re doing short & long term damage to your teeth. Instinctively, you may also know if you’re doing some serious damage to your teeth. If you wake up every day (for instance) with mouth/jaw/teeth soreness and a headache, you should look into purchasing a night guard. The good news is, any type of properly fitted, custom made night guard will protect your teeth from direct tooth on tooth contact, preventing teeth damage and effects that are associated with teeth grinding and/or jaw clenching (such as headaches, jaw pain, facial pain). If you grind your teeth, you may be all too familiar with waking up in the morning with painful jaws and a headache. So far, nothing protects your teeth more than a custom mouth guard. The mouth guard for teeth grinding is not like the typical sports mouth guard; rather it is a dental night guard. Among the available dental guards on the market, the soft dental night guard stands as the most common type used. A Soft Dental mouth guard for grinding teeth? There are two main types of the soft dental night guard. You have the over-the-counter (store bought) and the custom-made night guard. The custom made night guard is a special guard that is professionally modified to fit the dental structure of the patient. This one will ensure that the teeth do not grind and that you sleep comfortably without any pain. The custom made guards are quite comfortable and also, they help to prevent the soreness, headaches, and jaw pain. 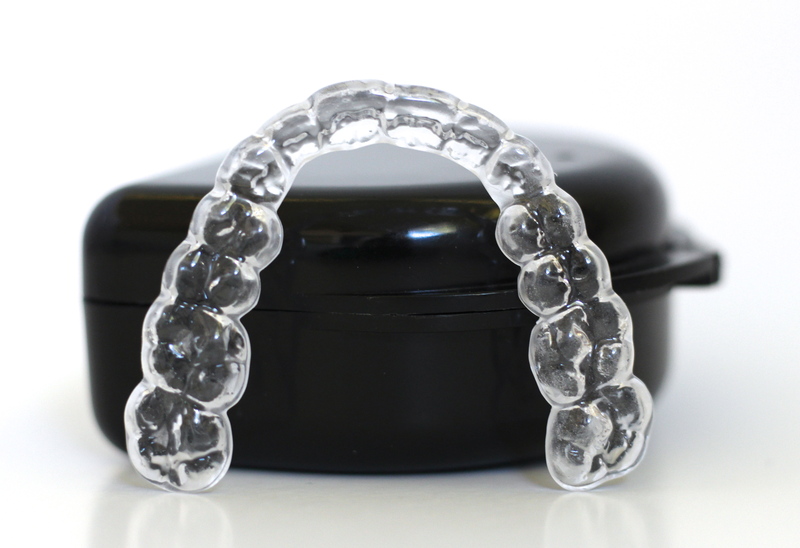 The store-bought night guards are pre-designed to fit every type of dental structures. Because these are mass produced, they may not be as comfortable as the custom made. Most of the one size fits all guards have a default size and fit. Also, the material used is a lesser quality than the custom made dental night guards and wears down much quicker. The soft night guard tends to be the most comfortable. Even if you try grinding your teeth while you have the guard on, there is no way your teeth will be damaged. The custom made soft guards are designed to fit the exact structure of the teeth and are totally flexible. Compared to the hard and dual laminated guards, these tend to be more adaptable and easier to get used to. Though the soft dental guards are comfortable in the mouth, some people may innately want to clench or grind on the soft material. One study has shown that some of the patients using the soft dental guards will attempt to chew the guard and also may grind their teeth more often. Another negative is that the soft dental guard has a limited lifespan. Most of the companies (including Sentinel Mouth Guards) that develop the soft night guard will terminate their warranty after six months. The other types of dental guards are more stable, and they can last for a longer time than the soft dental guards. What are dentists saying about the soft night guard? Regardless of the few flaws of the soft dental night guard, they are the most common types of guards on the market. These night guards are recommended by many dentists due to their easy adaptability and high customer satisfaction rate. 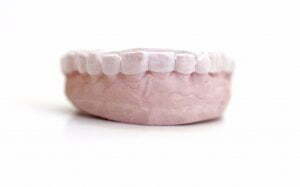 Dentists highly advise patients to go for the custom-made guards so keep in mind that a soft custom made night guard is still far superior to store bought “one size fits all” brands. Choosing a professionally custom made night guard helps to enhance the comfort and limit the grinding. The guard also feels more comfortable than the over-the-counter guards. The soft dental night guard is an excellent choice if you have teeth grinding or clenching issues when sleeping. This soft type has generally been the most common style of night guard produced in dental offices but recent research has indicated that the soft material may actually encourage grinding or clenching by up to 50%. The cases that have been reported/studied show that this new revelation is more prevalent with the thicker stock or boil & bite guards (such as when a person buys an over the counter mouthguard and tries to conform it to their teeth). However, you should still be aware of this risk when deciding on which guard to choose. The professionally made custom soft guards are small & comfortable but may wear down a bit quicker than the dual laminated and hard acrylic guards (depends on the degree of your grinding or clenching habits). Sentinel Mouthguard Co offers a 6 month replacement warranty on this guard type in the event that you grind through your guard or it becomes defective. 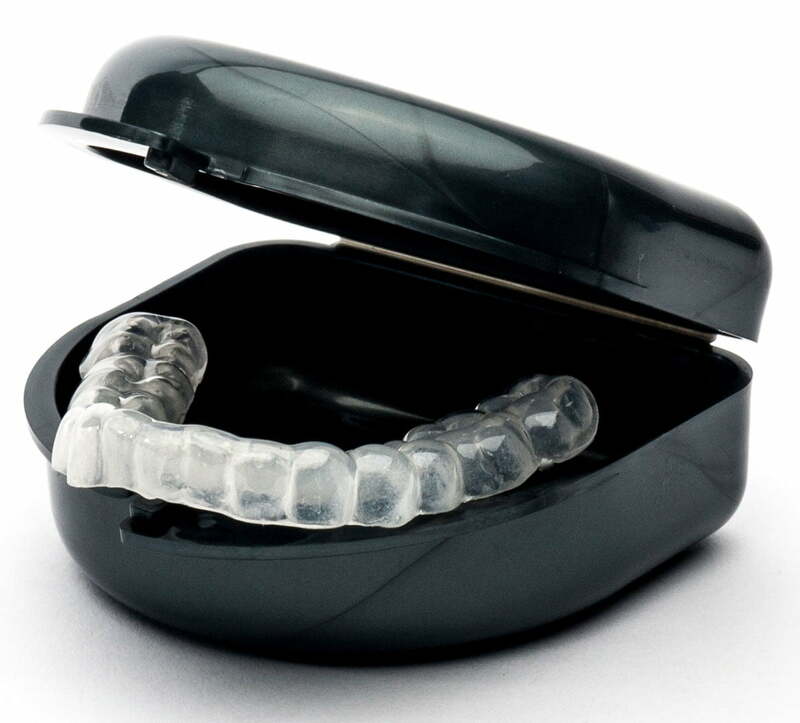 The hard acrylic-like night guard is small & low profile yet very durable. It is generally recommended for moderate to extreme grinders/clenchers or persons suffering from TMJ. Be aware that teeth may shift overtime. A hard acrylic dental guard does not allow much “wiggle room” for ANY changes to the teeth. So think about this when you’re making your decision. If you plan on having work done in the future that could change your dental anatomy (new crown, bridge, bonding, implants, veneers, even cavities being filled could alter your anatomy enough to change how your night guard fits) consider getting a night guard made for the opposing arch or choose a different (more adaptable) type. In addition to wearing a hard night guard, you may need to seek additional treatment (if suffering from TMJ). In some cases, a special type of night guard that could involve ramps and/or metal clasps may need to be made from your dentist/TMJ specialist. 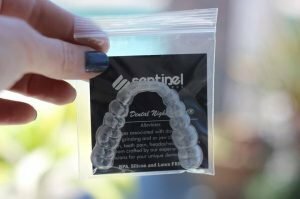 If you’re experiencing alignment issues or if you know you suffer from TMJ please consult with a dentist before ordering a night guard online. Sentinel Mouthguards offers a 1 year replacement warranty on this guard type in the event that you grind through your guard or it becomes defective. This guard type is relatively new on the scene. It combines two layers of material (a soft inside and a hard acrylic outside). It’s going to be a just a wee bit thicker than the hard acrylic guard. This nightime guard can handle heavy jaw clenching/teeth grinding. The soft plastic is comfortable against the teeth and the hard outside acts as a protective shell. Customer feedback has given us some insight into the preference of the general public. We have found that most people are extremely happy with the fit of the dual laminated night guard. Sentinel Mouthguards offers a 1 year replacement warranty on this guard type in the event that you grind through your guard or it becomes defective. Pro tip: Sentinel Mouthguard Co. guarantees 100% satisfaction. If you choose a guard and you’re not happy with it, we will make you a different type free of charge. • Sentinel Mouthguard Co offers a 1 year replacement warranty on this guard type in the event that you grind through your guard or it becomes defective. • must keep this appliance dry between uses as layers can separate if soaked in overnight cleaning solution or left with water sitting in the teeth compartments. When deciding on an upper or lower guard, there may be some obvious factors that will dictate your decision. For instance, if you’re missing teeth on either the upper or lower set, you will want to choose the set that has more. Or if you know you’re grinding your teeth, and you need to get a night guard quickly but you have some upcoming dental work on your upper teeth that may change your dental anatomy, you will want to go with the lower teeth(or vice versa). Same thing with loose teeth, or loose crowns/bridge work, etc- You’ll want to choose an opposing guard and avoid the potential to loosen that dental work with the continuous use of a tight fitting night guard. Now, if you have all of your nice solid teeth on both the upper and lower and no plans for upcoming dental work, it really just comes down to preference. The upper guard has been the “go to” choice for many but if you think a lower guard would feel more comfortable then go for it. We’ve had many customers say that they prefer the lower mouth guard for grinding teeth over the upper as it tends to be smaller and less obtrusive. *note- if you’re a tongue thruster you may be inclined to lift the edge of your lower night guard with your tongue (something to consider). Are Night Guards BPA Free? Latex Free? What Are Night Guards Made Of? Most night guards are made from EVA material (Ethylene-vinyl acetate (also known as EVA) is the copolymer of ethylene and vinyl acetate).The material is BPA free and latex free & is not considered hazardous or toxic by OSHA per 29 CFR 1910. For good measure, you can always ask your dentist or night guard lab to supply information regarding the materials used in the fabrication of your sleep device. Sentinel Mouth Guards are made with Proform materials. The material is BPA free and latex free & is not considered hazardous or toxic by OSHA per 29 CFR 1910.